Toradex is thrilled to announce the arrival of the newest member in its Apalis family of computer-on-modules, the Apalis iMX6. 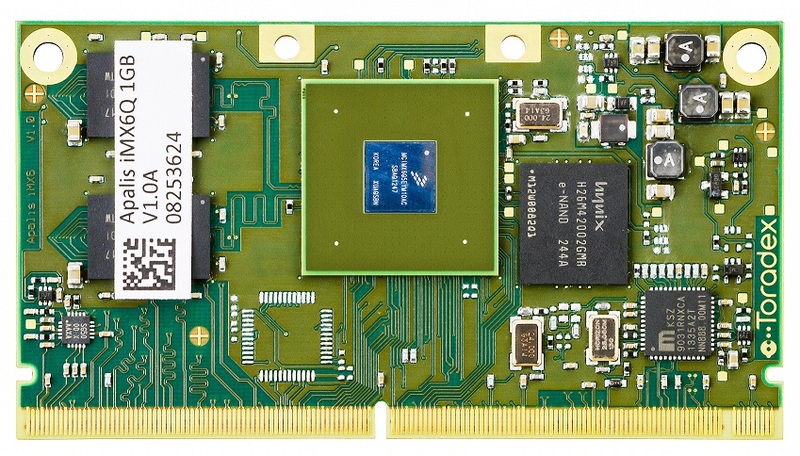 The module is based on Freescale i.MX 6 series of SoC, runs a quad-core ARM Cortex-A9 CPU, and offers an operating frequency of up to 1.2 GHz. Apart from the benefits of long term product availability (of more than 10 years), and compatibility with the existing Apalis T30 module, this module is also qualified for industrial temperature range -40° C to 85° C.
More details including datasheet shall be published by the last week of February. We will be showcasing the Apalis iMX6 computer module in the Embedded World Exhibition, 2014, in Nuremberg (Hall 1/1-118 and Hall 4/4-139). For more details on Apalis family, click here. To know more about the Apalis T30 module, click here. Here's a first look at the module.